Welcome to Zip A Bag! We are starting at the very beginning and learning about zippers today: what kinds are available for bags, the names of their parts and how to prepare them for installation. 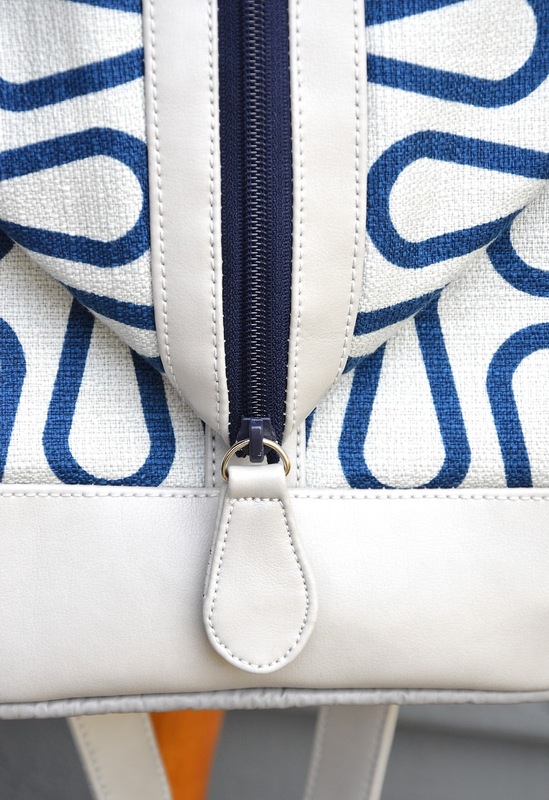 If you're used to sewing bags, this chapter will be old news. Feel free to yawn and click away to another blog. 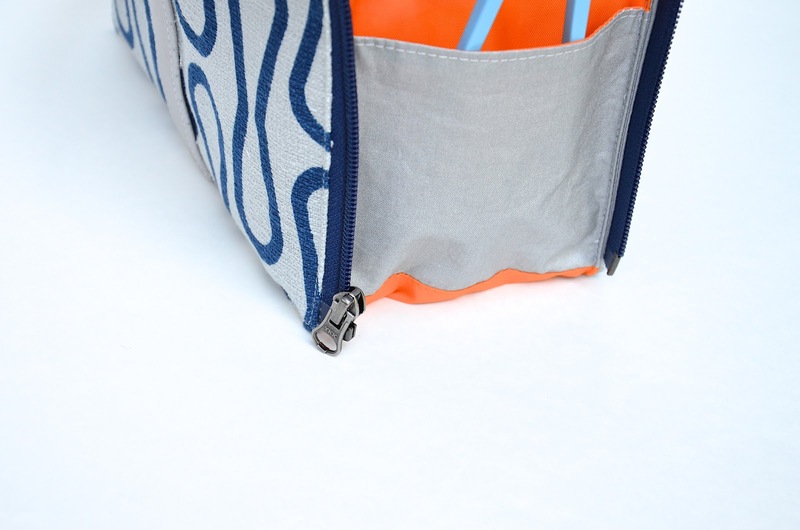 If you're used to sewing garments, this chapter will be strange because clothes-zippering is quite different from bag-zippering; the zippers aren't the same, and neither is the way we install them. If you're new to zippers, I hope this chapter will be helpful in demystifying zippers and encouraging you to try them out - because they're really not as horrible as you've heard. 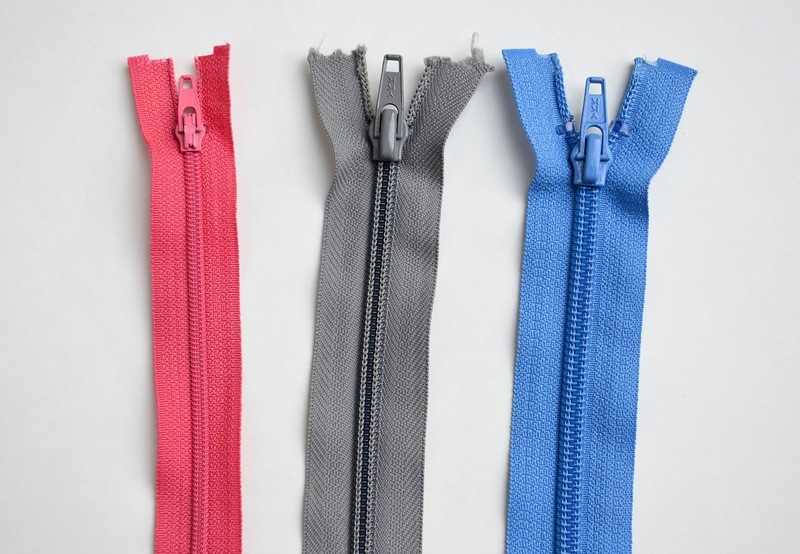 When you introduce zippers into your sewing repertoire, you are also learning a whole new vocabulary with which to communicate about them. 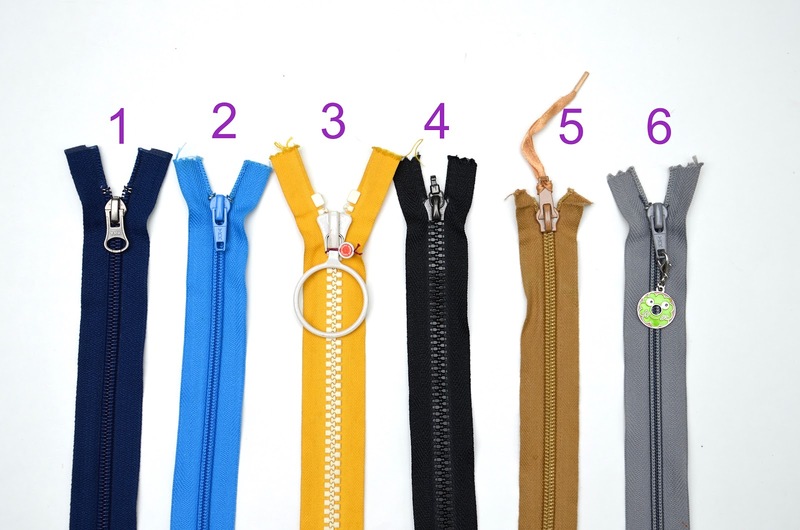 Behold the typical zipper(s) in the picture below - the yellow one is partly unzipped - we call this state (and any degree of unzipped-ness) "open". The blue one is completely zipped up - we call this state "closed". 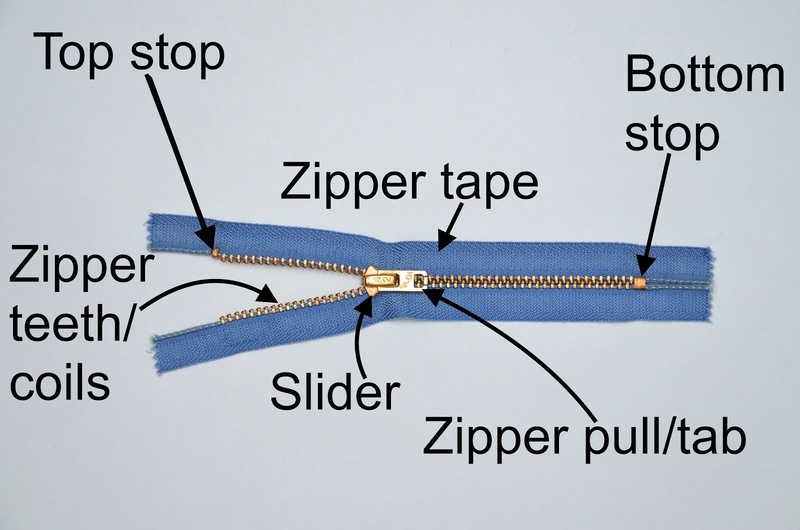 A typical zipper has standard parts, with standard names. I, of course, have used zippers since I was thirteen, without knowing these names. 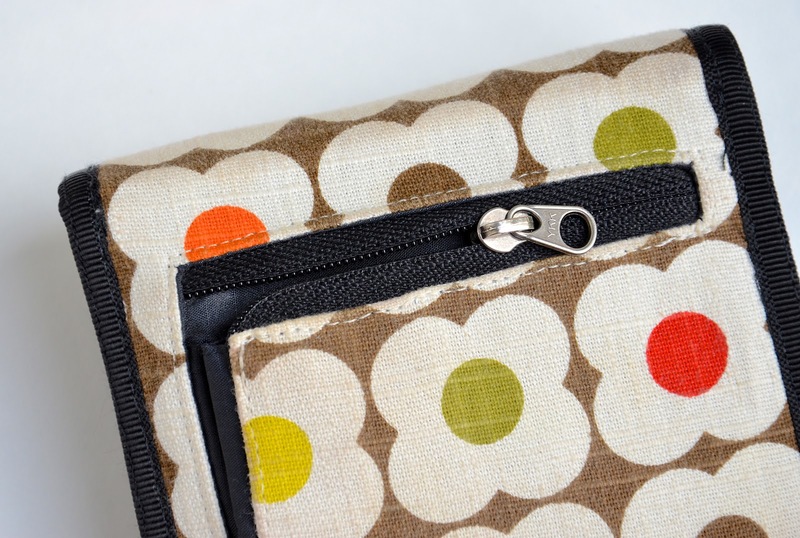 It wasn't until I started blogging centuries later that I realized I needed real zipper words to put in my tutorials because "whatchamacallit slidey thingy" just didn't cut it. As I understand it, there are two main kinds of zippers - the kind with coils and the kind with teeth. Coils are continuous; teeth are blocky and individual, and sometimes called "molded plastic" because of how those teeth are formed as discrete bits. Either way, regardless of whether it's comprised of coils or teeth, that middle portion that opens and closes when the slider moves up and down it is called the zipper chain, and it is made from a variety of materials, which we will discuss later. Sometimes, the zipper tape (that's the fabric part you stitch on) is absent, and the entire zipper is literally just the zipper chain, which is cool. Sadly, unless in the role of lanyards like the one above, these are useless in bags because you cannot sew them into an opening, there being no actual material to support stitches. I prefer coil zippers over tooth zippers in my bags, particularly around rounded edges. For one, the sliders run more smoothly over coils than teeth. For another, if need be, coils are easier to sew over than teeth. That said, I have used both kinds (coil and tooth), depending on what's available in the colors and lengths I want. 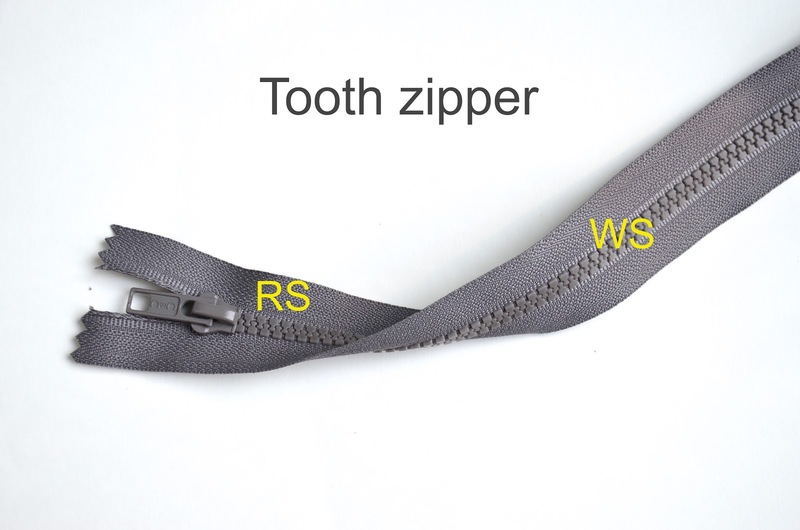 In general, the side of the zipper with the pull/tab is the RS; the other side is the WS. 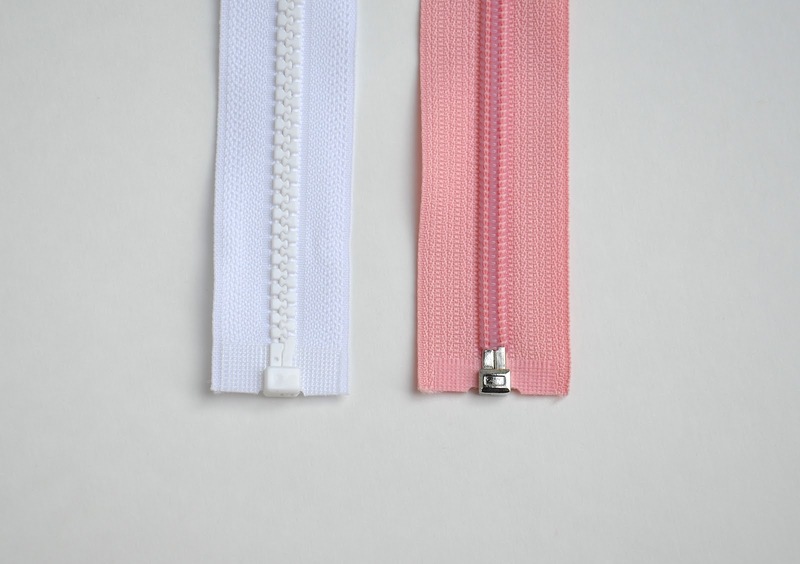 In teeth zippers, the blocky teeth appear on both the RS and WS so that, apart from the appearance of the slider (the pull/tab will be on the RS), it is practically reversible. 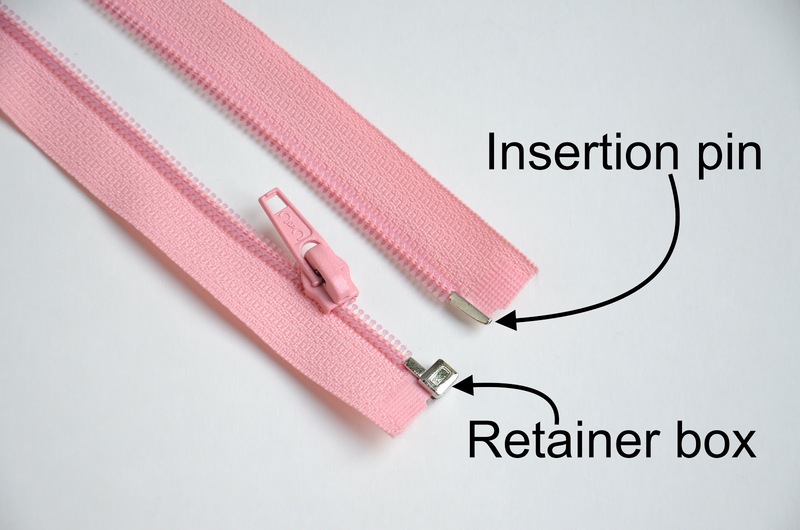 This means that, in the presence of a slider with a double-sided tab - to control the slider on either the RS or WS of the zipper chain- you'd be able to use it in a reversible project. 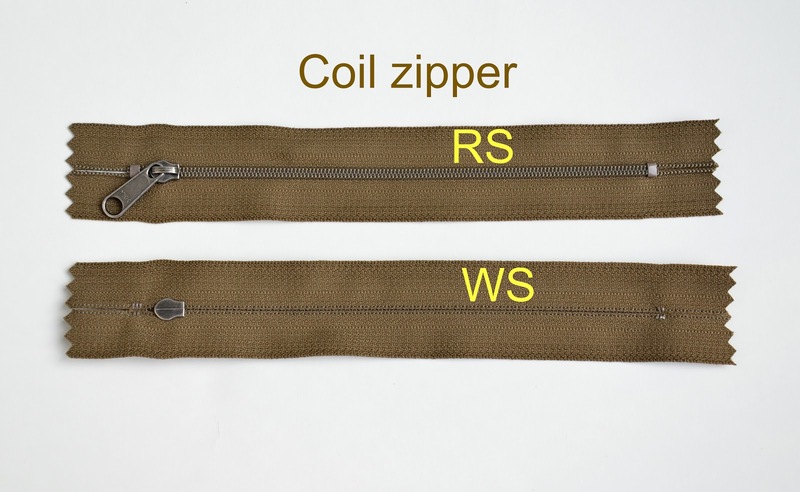 In coil zippers, the RS/WS difference is more obvious, because the coils lie on the RS while the WS is smooth. However, it is now quite fashionable to use the backside (WS) of coil zippers as the RS, because it is smooth and the coils are hidden. Here is one of those WS-out zippers on the coin compartment of my wallet - you can see the coils on the inside (WS) of the pocket. 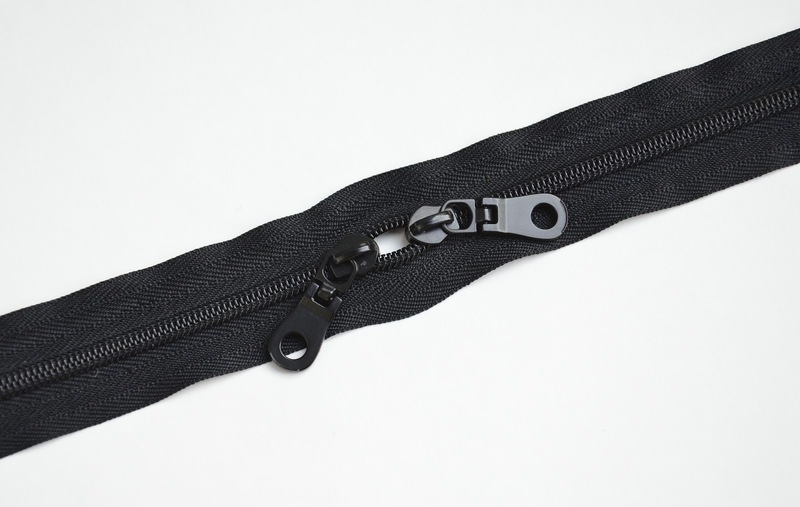 The sliders for these WS-out zippers are specially made to slide WS-out; they cannot be interchanged with regular RS-out zippers. 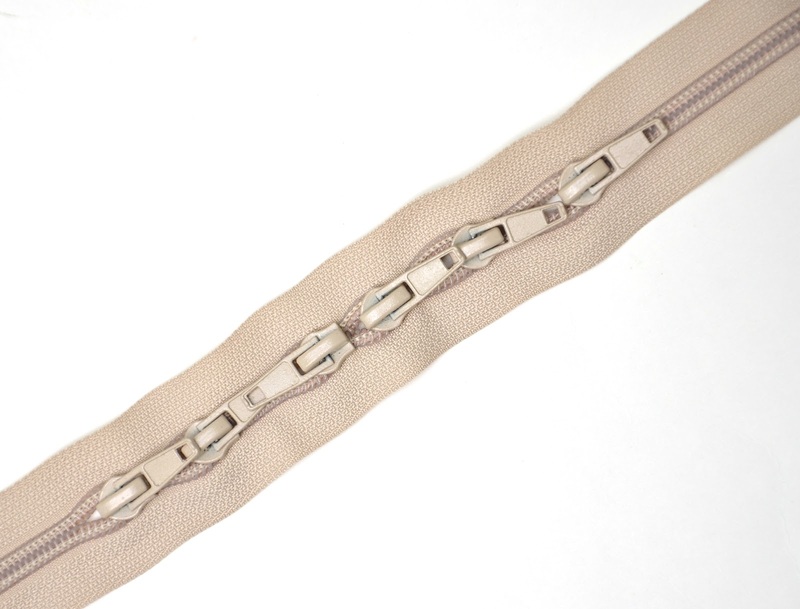 Invisible zippers (of the sort we use in clothing) are another example of WS-out coil zippers. 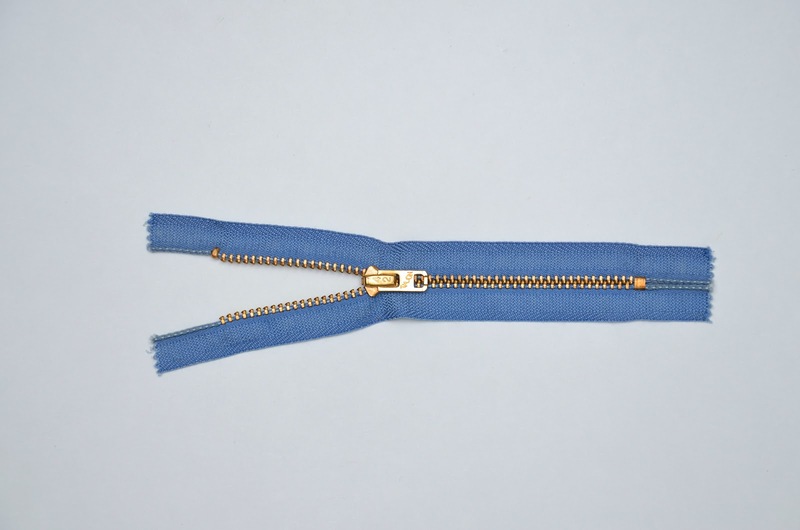 The blue zipper in the photo below is a non-separating zipper. This means that if you pull the slider all the way to the bottom stop (notice how this sentence makes complete sense to both of us, since we are now experts in the language of zipper parts? ), it stops there, and nothing else happens. whose sliders go all the way to their bottom stops and actually slip out and completely separate the zipper chain and tape into two halves. And because of the additional fiddly mechanism at the tail end of the separating zipper, there are two new terms to learn - the insertion pin and the retainer box, into which that pin goes in order to bring the coils/teeth together. 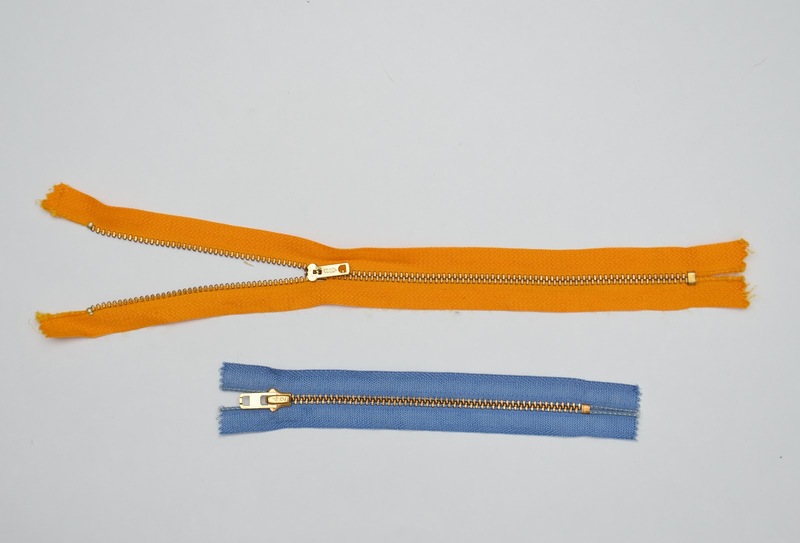 Separating zippers can be found among both the coil and tooth variety. and their separating mechanism can be made of metal or plastic accordingly. 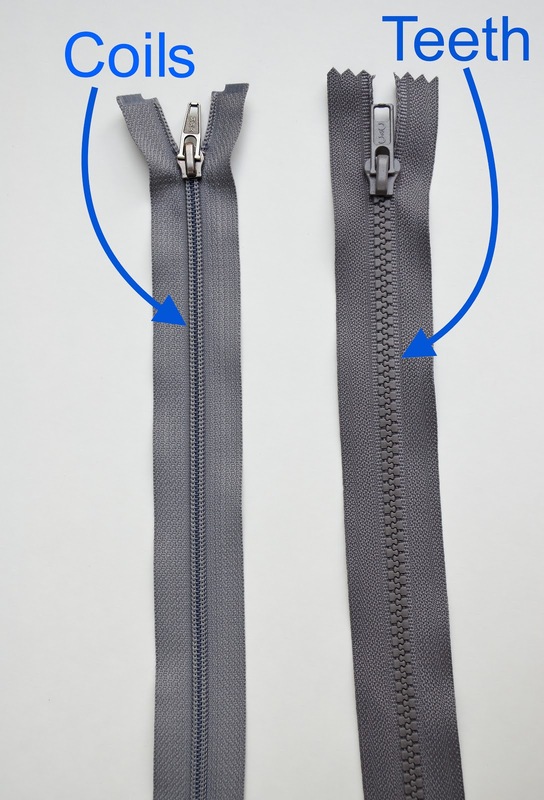 In garments, separating zippers are really useful when you need to completely separate two pieces of fabric so you can get in and out of them without putting them over your head or having to step into them. Coats and jackets, and tight-fitting exotic things like my qipao blouse are some examples of garments with separating zippers. and you will see some of them later in this series. has 9" worth of usable coils or teeth, regardless of how long the fabric tape protrudes from either end. (ii) tooth/coil sizes. The size referral system, incidentally, is in numbers from #1-#10, where, instinctively, the larger number is for a larger tooth/coil size. So a #5 tooth zipper is larger than a #3 tooth zipper, for instance. 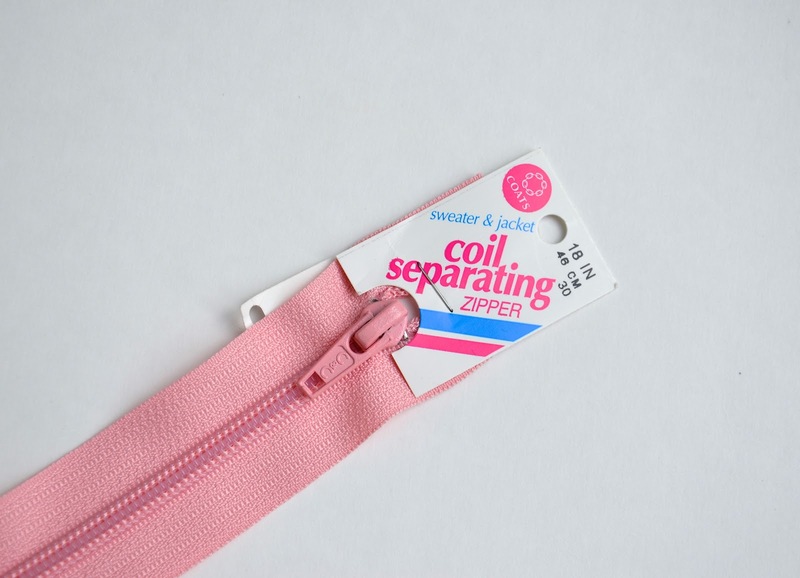 Most of us happily buy zippers simply by looking at what's available in a store and considering only the length, with nary a thought to coil or teeth size. 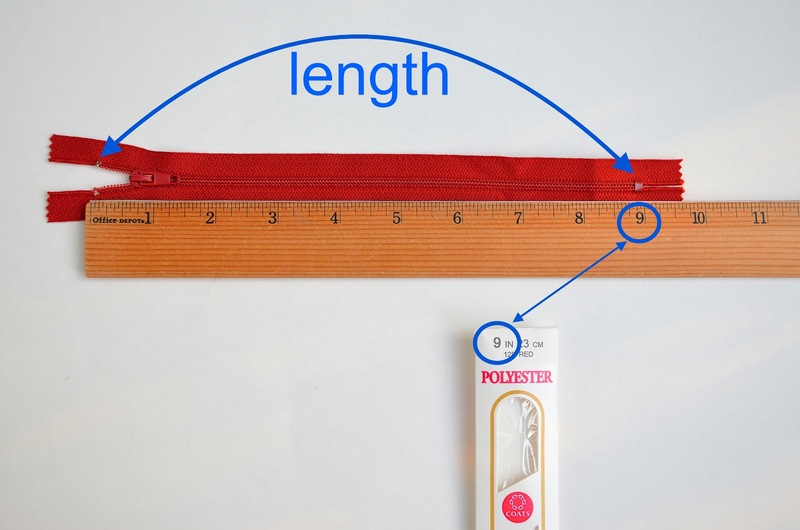 However, knowing how the size system works is helpful when buying zippers online when you cannot see them in person, or when matching up zipper pulls to, say, a continuous by-the-yard zipper tape of the same size. What's more pertinent is the fact that larger teeth/coils usually translate to stronger zippers. Which in turn affects which kind you might want for particular projects. 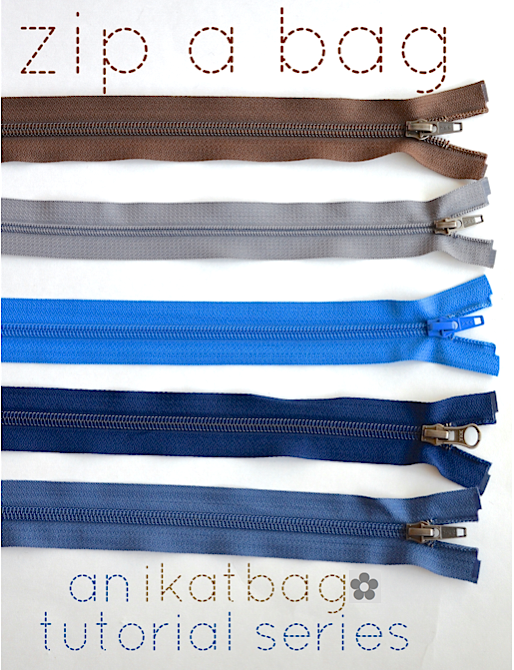 Any size or kind of zipper can be used in a bag, pouch, purse, wallet or any other kind of receptacle. 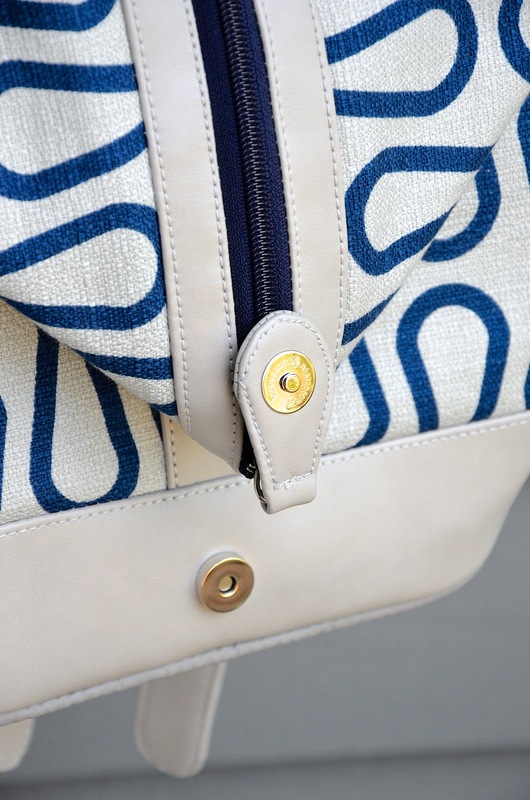 You can even use clothing zippers - including invisible zippers - in bags. No one's stopping you. 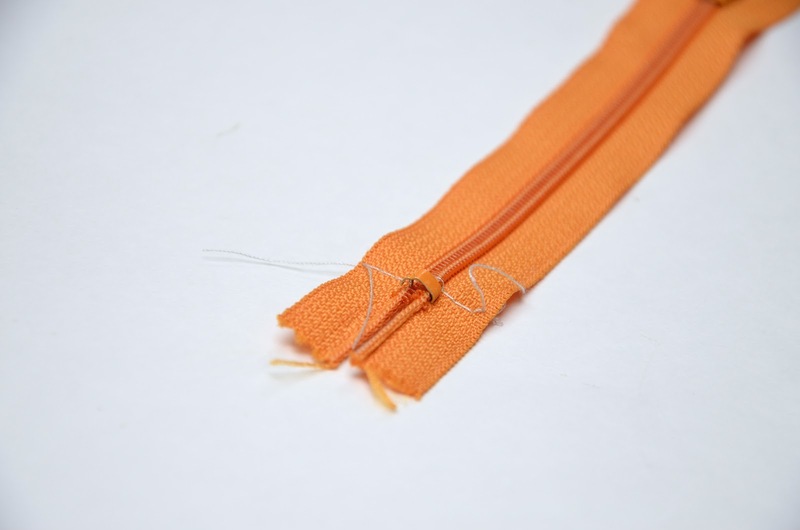 However, in garments, we usually want zippers to be discreetly positioned, preferably hidden in seams, because their function is to allow you to get in and out of the garment once with each wearing, without having to rip a seam just to do it. 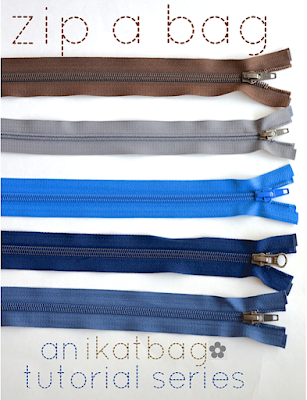 Zippers in bags tend to be a little more heavy-duty, often also with bigger pulls and tabs so they can be repeatedly used to open and close pockets, and the bags themselves. 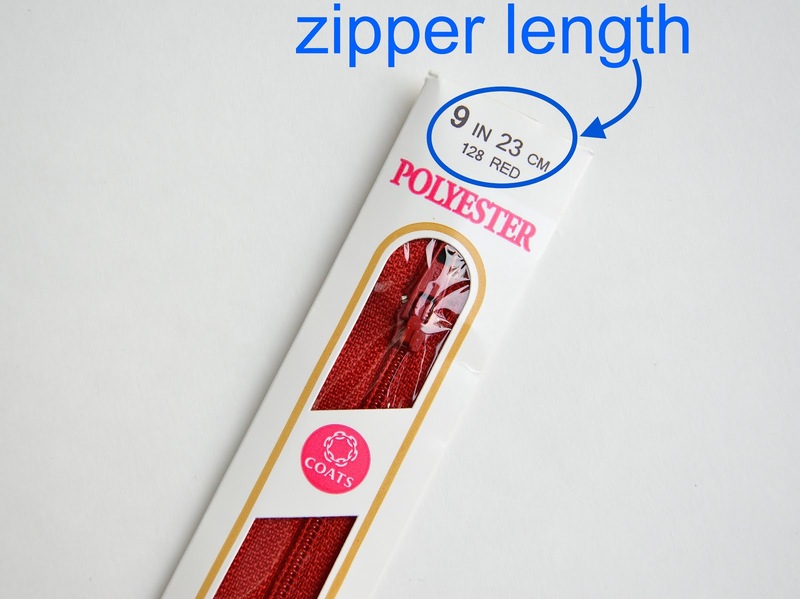 There are no rules for zipper installation other than its length (i.e. between the stops) match or be a little longer than the opening. That aside, anything goes, e.g. 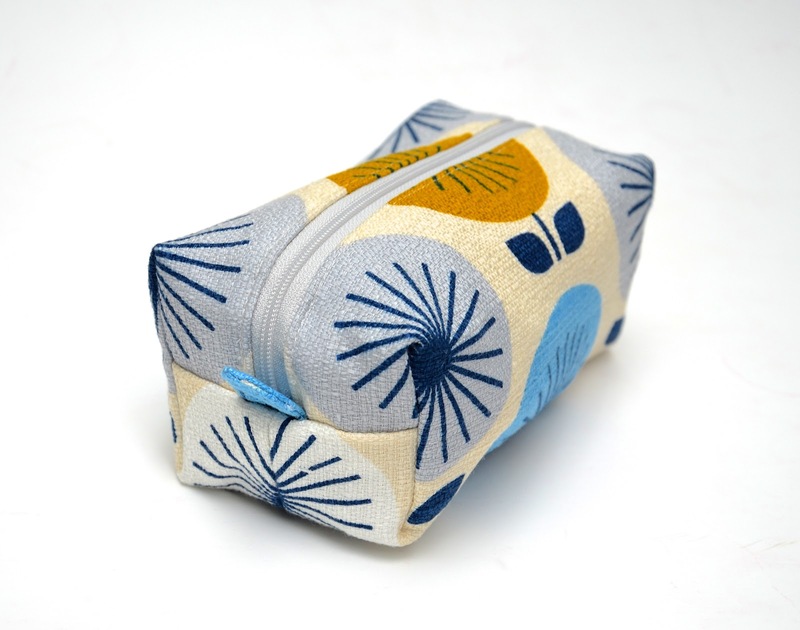 You can sew over the coils (it's a little harder with teeth). You can make a welt opening to frame zippers. You can squeeze them between the folds of a seam gap. You can face the backsides (WS) completely. You can leave their backsides (WS) unfaced and exposed. You can bind the edges of the zipper tape. You can remove the stops, the entire pull, the tab, use one side of the coils at a time and thread both ends through the same pull. 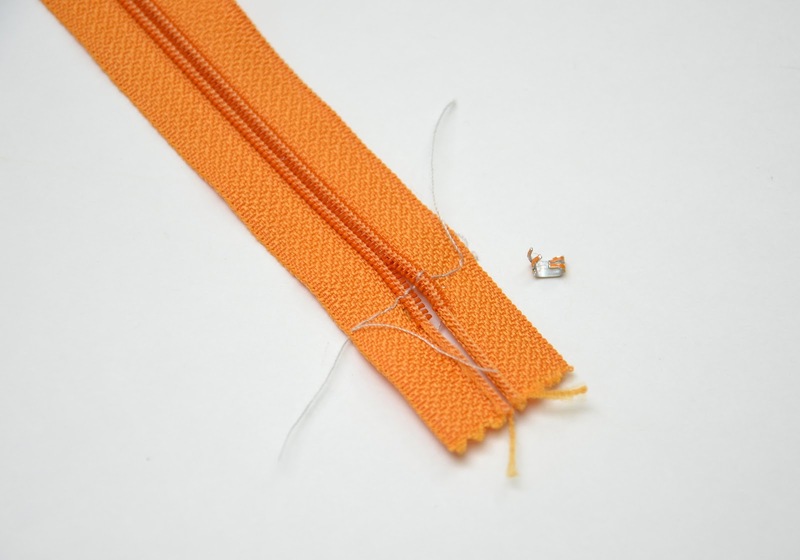 Here are two easy ways to tinker with zippers in preparation for installation. 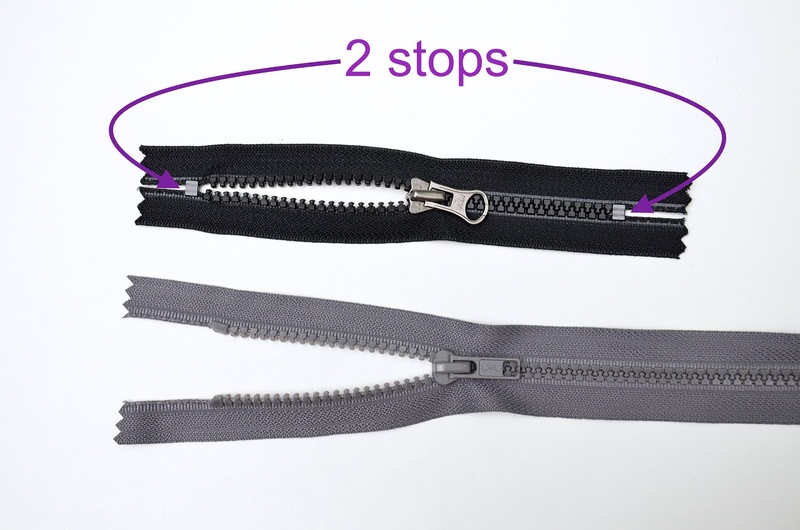 The typical zippers you might find in a fabric store have closed stops on their bottom ends and open stops on their top ends (see grey zipper in photo below). It is not uncommon, however, to find zippers with closed stops on both ends, like the black zipper below. 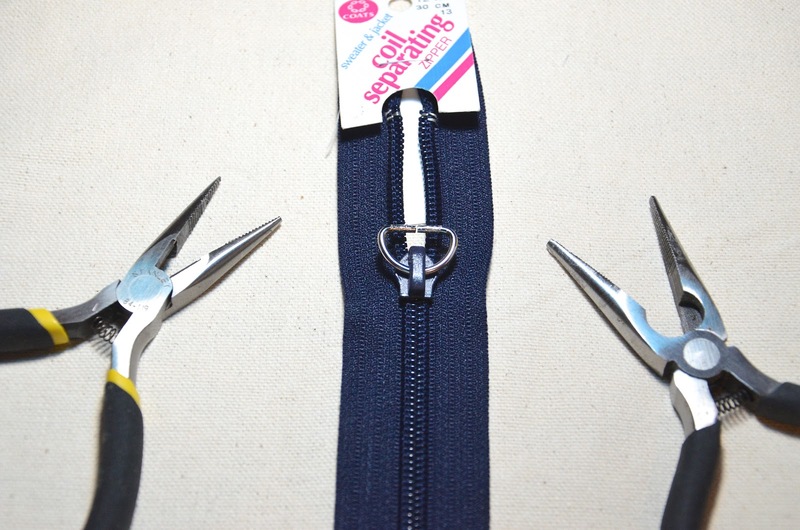 These zippers are useful for things like welt openings (think pockets) and bag openings because you don't have to hold (or baste) the top ends of the zipper tape together when you install it. Sometimes, stops get in the way, and you might want to remove them before installing the zipper. 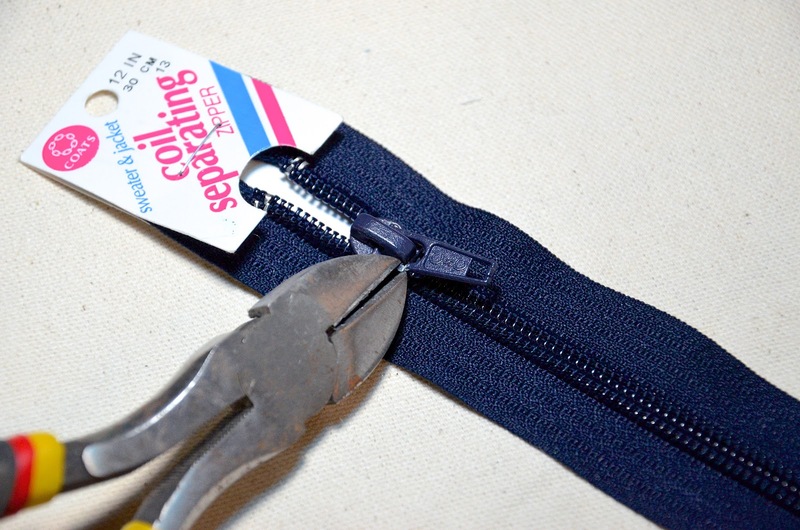 If you are fortunate enough to have a zipper that's much longer than the opening into which you are installing it, you can sew over the coils without going anywhere near the stops, and any excess zipper tape (including the end bit with the stop) can be cut off. However, when I am working with a zipper that's very similar in length to the opening, I find that I am sewing very close to the zipper stops themselves and run the danger of breaking my needle on them. In such cases, I will take the time to remove the stops. and off. To prevent the zipper chain from accidentally opening up (or the slider from accidentally sliding off the now-stopless end), I sew across the bit where the stop used to be. or within DIY fabric stops. We will learn both these methods in later chapters. 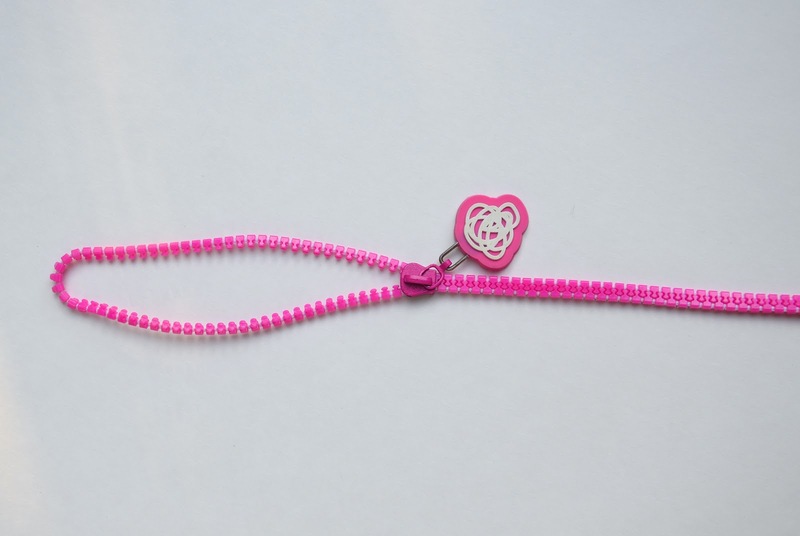 Typically, zippers have one slider per chain. Sometimes, however, there is more than one slider on a zipper. which is common in suitcases and duffle bags and cases and other receptacles in which you might want to open a zipper from different points. You can add extra sliders to any zippers. 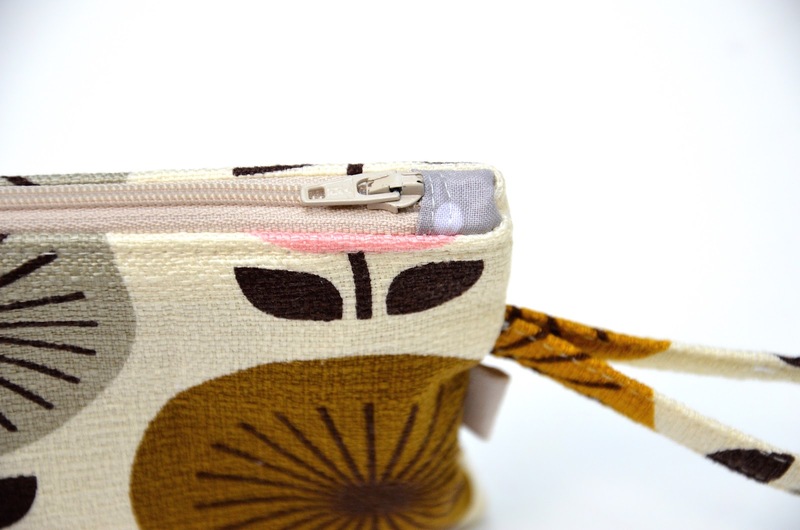 All you need is to slide it on the zipper chain, removing stops if necessary. There are many tutorials on the internet for this. 5 Pull/tab with ribbon or tape threaded through. 6 Pull/tab with commercial charm attached. so I could install an oversize vinyl pull with a magnet in it. You will see this in action with its bag in a later post. To get some practice in preparing and installing zippers, we'll be making some classic zippered pouches in the next few posts. 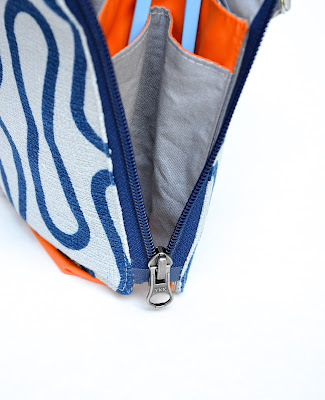 Then, we'll move on to using zippers for purposes other than just opening and closing bags and pockets - check back soon! I've used a lot of zippers, but I've already learned something - I didn't know there was a WS-out zipper! Yes, they're very fashionable these days, and not just on bags. Clothes, too. The newer backpacks have them, as do the more rugged sports bags and outdoor bags. Very chic and svelte finish. I'd use them all the time if I could more easily find them. Maybe time to visit the main SR Harris store, which has a vast stock of zippers for cheap. Ah yes! 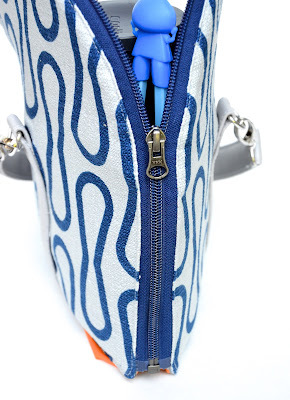 The former is what they call "reversible zippers". 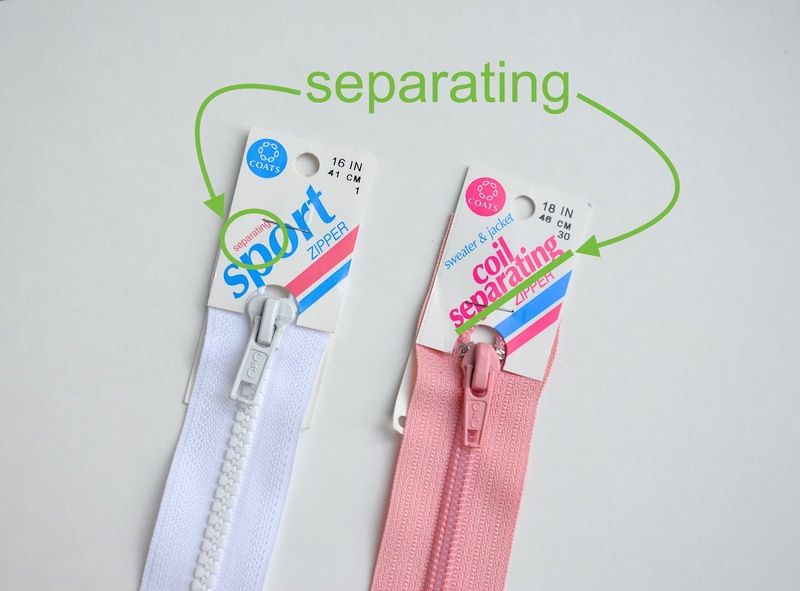 I think the latter are also called reversible zippers of some kind, or maybe they are two-way zippers, or something. Can be found on reversible jackets, or jackets that have the removable lining layer that needs to be zipped on or off. Like the sort we have here in our icebox of a state of MN. Not that we'd ever unzip the lining out because, you know, we're always freezing. And wet. And yucky. Can you tell that yesterday's rain has dampened (pun intended) my spirits completely? Hee! Once again an amazing, informative post with such admmirable attention to detail! Thanks for making and sharing this! I learnt all sorts of new zipper words today that I know will come in handy. I always learn something reading your blog! Fantastic serie! Brilliant! 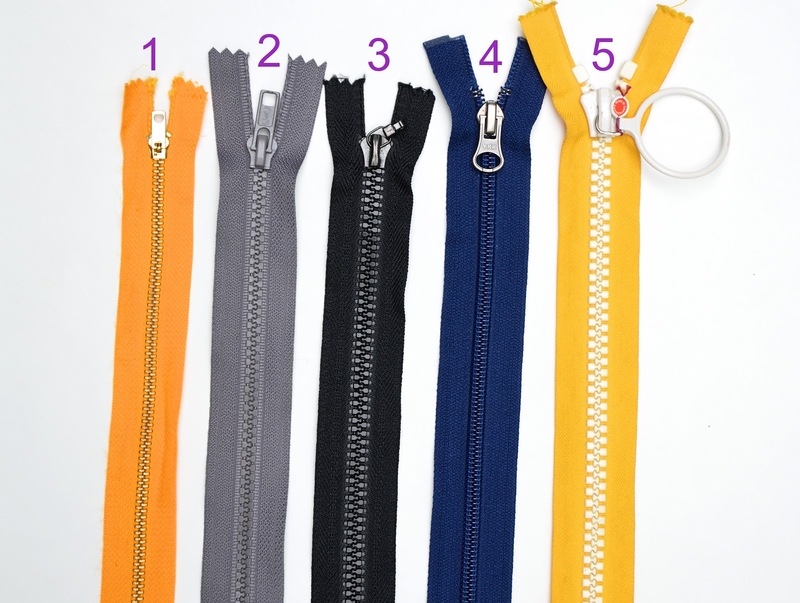 I've used zippers for years and sort of knew all the information in this post but not in a logical ordered way that would help me make decisions. Looking forward to future posts. Thank you so much for this tutorial. I have been sewing for years, but this is the first logical explanation I have ever seen about the mechanics of zippers. I guess manufacturers think we are smart enough to sew a zipper without needing how they are made. Of course I have seen zippers on many supply list, but never an explanation of why this type versus that type. Again, thank you! The pull with the snap in it just blew my mind. Me too! I saw the pic and just thought "WOW!" Brilliant straightforward explanation of zips. Thank you. Love this! You are on a winner hear I am eager to learn more! Great job! Thank you for taking the time to post possibly the most useful thing I've read on the internet in a long time. Your content is excellent, and I am grateful that you share it freely. WOW! Thank you for such an amazing tutorial!!! I had no idea that there was so much to learn about zippers! Yeay, it has started! I learned so much already, and am eagerly looking forward to the rest.